Waddell, S., McLachlan, M., Meszoely, G., & Waddock, S. Large Scale Change Action Research. In H. Bradbury (Ed. ), Action Research Handbook (pp. 538-548): Sage. Action researchers addressing change are often confronted by two key problems. One is that the issue they are addressing, even if apparently local, is often heavily influenced by larger systems within which the issue is embedded. Working to solve a problem at a neighborhood or local community level inevitably hits up against the structures and decision-making processes that the community might believe are beyond its capacity to influence. We refer to this as the embedded system issue. Some action researchers start with a large scale in mind, but the second problem for many is that adequately expanding the focus to systems of such scale and with such an array of actors and geographies create a perception that the task is beyond the scope of action research approaches. We call this the methodology for scale issue. In our chapter we illustrate and develop a framework for understanding and addressing these action research issues using two cases. We conclude by proposing seven guidance notes for scalable action researchers who want to address these issues. Social partnerships’ development challenge: Comprehensive self-development. In M. Seitanidi & A. Crane (Eds. 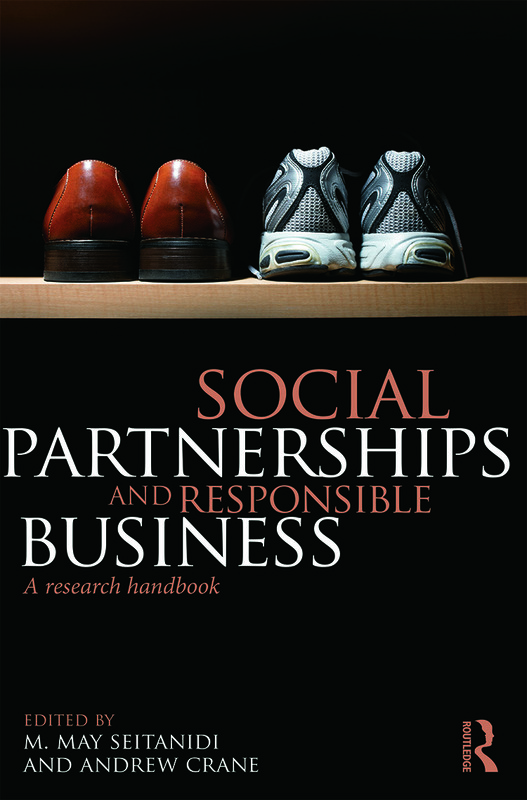 ), Social partnerships and responsible business: A research handbook (pp. 374-381). New York, NY, USA: Routledge. 2014. This is a chapter in a collection by leading analysts who critically examine the motivations for, processes within, and expected and actual outcomes of cross-sector partnerships. In opening up new theoretical, methodological, and practical perspectives on cross-sector social interactions, this book reimagines partnerships in order to explore the potential to contribute to the social good. A multi-disciplinary perspective on partnerships adds serious value to the debate in a range of fields including management, politics, public management, sociology, development studies, and international relations. The chapter looks at social partnerships through the lens of eight competencies that have been identified as key to effective social partnerships: leadership, network development, measurement, change, communications, learning, advocacy, and resource mobilization. Although many of the names of the competencies are similar to those for other types of organizations, the chapter explains their distinctive qualities for social partnerships in terms of skills, knowledge and attributes. “Global Finance and the role of Responsible Investors: Real and potential”. In Responsible Investment in Times of Turmoil. Eds: W. Vandekerckhove et al. Springer Publishers. 2011. The socially responsible investment (SRI) phenomenon is said to be entering the mainstream of financial intermediation. From a fairly marginal practice promoted or campaigned for by NGO’s and at odds with financial practice and orthodoxy it grew into well formulated policy adopted by a wide range of investors. Academic literature on SRI has also boomed on the assumption that mainstreaming is taking place. However, little thinking has been carried out on questions specifically arising from this alleged ‘mainstreaming’. This book, addressed to those with a scholarly or practitioner’s interest in SRI, starts filling this neglected dimension. The first chapter of this book by Steve Waddell describes the global financial system in terms of major institutions with maps. It identifies the current role of responsible investors, and suggests options for them to enhance their influence. 2007. Multi-stakeholder networks: emerging systems for the global common good. Lead author with Khagram, Sanjeev. Pp. 261-287 in Partnerships, Governance And Sustainable Development: Reflections on Theory and Practice, edited by P. Glasbergen, F. Biermann, and A. P. J. Mol. Cheltenham Glos, UK: Edward Elgar Publishing. Chapter 20 in Learning To Talk: The Early Years of the UN Global Compact; Malcolm McIntosh, Sandra Waddock and Georg Kell (eds. ), Greenleaf Publishing, Sheffield, UK. When I first introduced the Global Compact at the World Economic Forum in Davos in January 1999 I warned that unless more serious consideration were given to social and environmental issues the global economy would grow ever more fragile. I called on business leaders to join a Global Compact as a vehicle for exercising enlightened self-interest: to embrace universal principles in the area of human rights, labour and the environment and to support United Nations goals to contribute to more stable and inclusive markets. I am delighted to say that business has heeded the call to action. More than 1,200 companies from over 70 countries, as well as dozens of civil-society organisations and global trade unions, are learning how to work together through learning and dialogue. The Compact has inspired a range of new projects on the ground, and many corporations are addressing issues such as human rights for the first time. In Chapter 20 Steve Waddell discusses the Global Compact’s strategy as a Global Action Network. With Janelle Plummer. Construyendo sobre los activos de socios potenciales. Partenariados en Foco: Construyendo capacidades para la gestion publico-privada. J. Plummer. Argentina, IIED – America Latina: 69-128. With Janelle Plummer. Chapter 7 in Focusing Partnerships: A Sourcebook for Municipal Capacity-Building in Public-Private Partnerships. London, UK: Earthscan Publications LTD. (for UNDP, DFID University of Birmingham and GHK International). Private-Public Partnerships are the way forward for urban development in the South as well as in the North. This volume provides an immensely valuable, practical sourcebook on how such partnerships can be developed in ways that meet the needs of the poor and reduce social exclusion. Chapter 7 builds on Steve Waddell’s analysis of the distinctive competencies of business, government and civil society as guiding rationales for the formation and design of partnerships. Chapter 14 in Blendell, Jem (ed. )Terms for Endearment: Business, NGOs and Sustainable Development. Sheffield, UK: Greenleaf Publications. With contributions from an outstanding and diverse group of experts from business, consultancy, research institutes, NGOs and academia, Terms for Endearment investigates the how and why of these new collaborations and provides concrete examples of business working with stakeholder pressure for sustainable development. In Chapter 14 Steve Waddell lays out the rationale for partnering with NGOs. Major author and researcher. Building Bank-Community Based Organization Partnerships. Washington, DC: The National Community Reinvestment Coalition and Department of Housing and Urban Development.